Biosecurity is the prevention and control of pathogenic microorganisms from contacting animal or human populations. In the context of modern poultry production, it is essentially keeping the birds separate from the agents causing the disease. Used properly, biosecurity will also minimize the effect of disease and contain the spread of disease, if found. 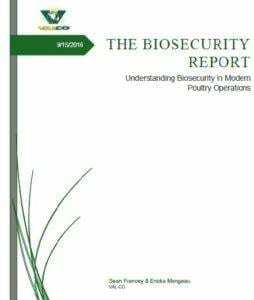 As such, biosecurity is first and foremost a management-based approach. Initial design of biosecurity policies and procedures should incorporate input from veterinarians, state agencies, and national guidelines. An understanding of the major diseases present today will aid the producer in crafting and understanding the biosecurity policy. Major infectious poultry diseases include, but are not limited to, Newcastle Disease, Salmonella, Mycoplasma, and Avian Influenza. While each of these exhibit different symptoms, they are all highly contagious. Each can be transferred from bird to bird by direct transmission or through contact with particles that have been carried in on the clothing or materials used by farmers. This means that farmers need to pay special attention to their movements, their washing procedures, and their flocks, to ensure that diseases are not spread, and if they are, that they are caught early. Farmers should have an established set of practices and guidelines that apply to all employees of the farm. To help farmers establish a biosecurity practice, the National Poultry Improvement Plan has outlined habits and routines for farmers to adopt as needed at their own facility. While many practices are common sense, practicing biosecurity deliberately will help keep disease down and birds healthy.